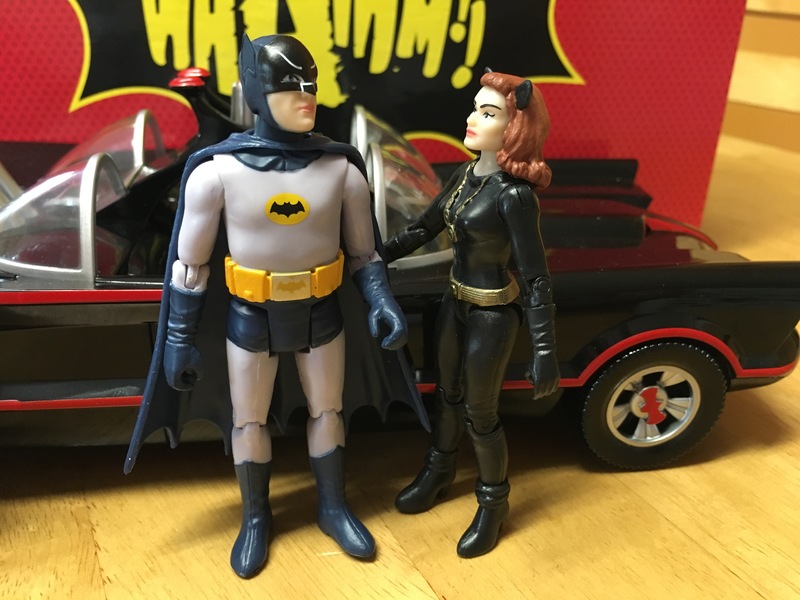 Check out the FUNKO BATMAN ’66 INDEX of stories and features. Click here! 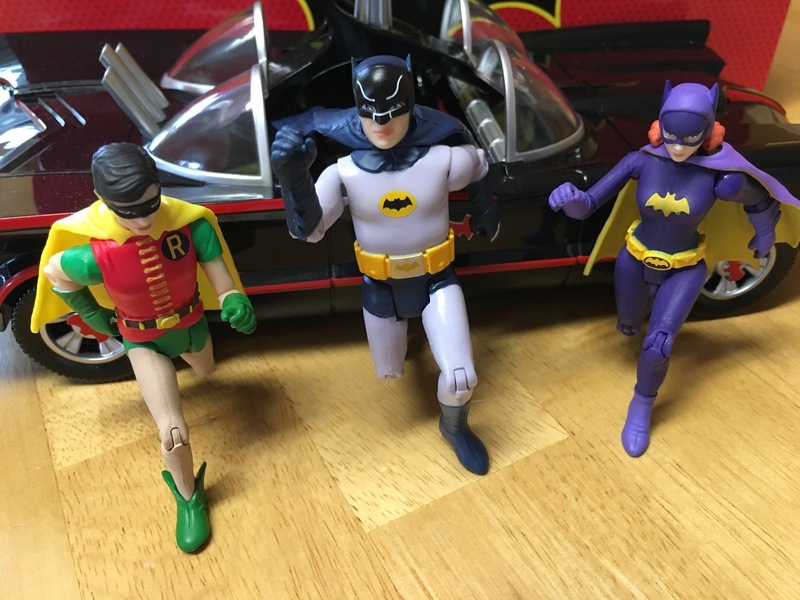 For a full review of the Batmobile, with Batman and Robin, click here. 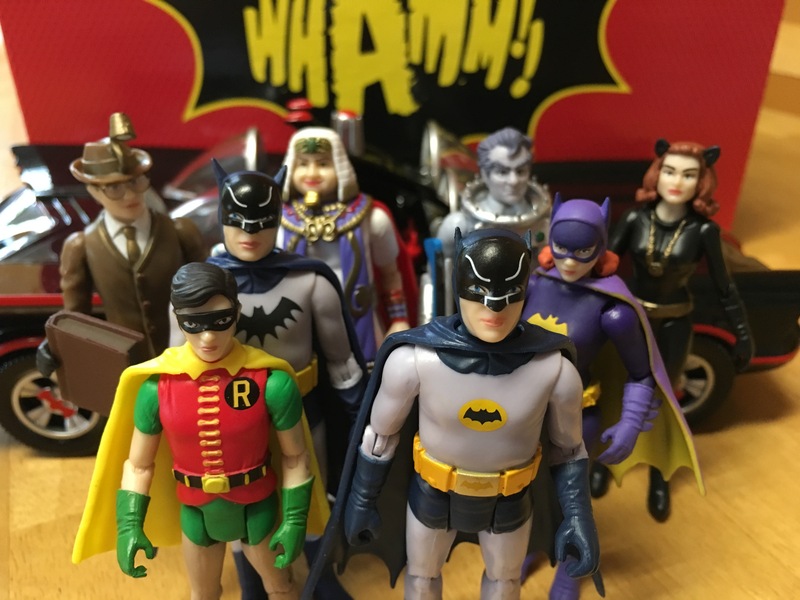 I’ve been saying for months that Funko’s Batman ’66 3.75-inch series has the chance to be the show’s definitive action-figure line and here we are, with the first full wave released within days of Adam West’s death. A coincidence to be sure, given that these figures actually started shipping before the news broke. 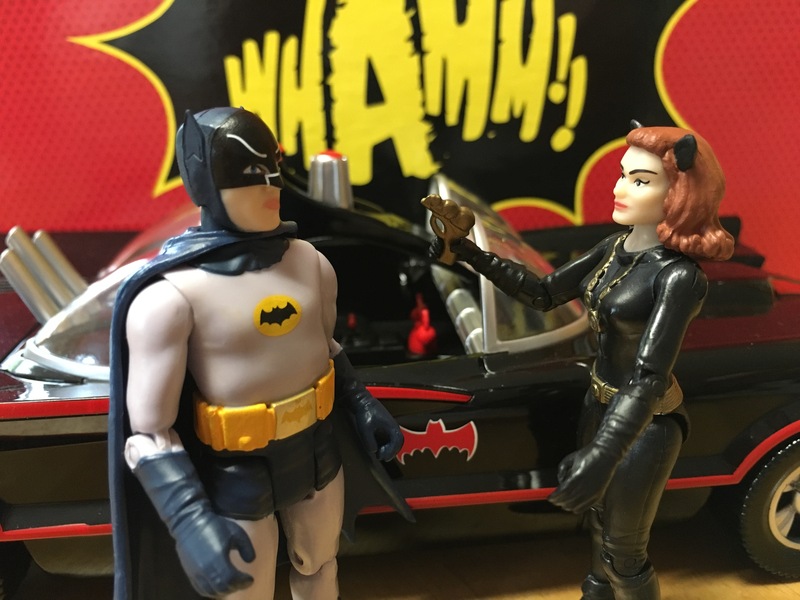 But fans of his Caped Crusader have an opportunity to celebrate his legacy in a particularly tangible way this summer, with new miniatures of Batman (two kinds), Batgirl, Catwoman, Mr. Freeze (two kinds), King Tut and Bookworm. Not to mention the Batmobile, which came out a couple of weeks ago, with Batman and Robin included (click here). 1. 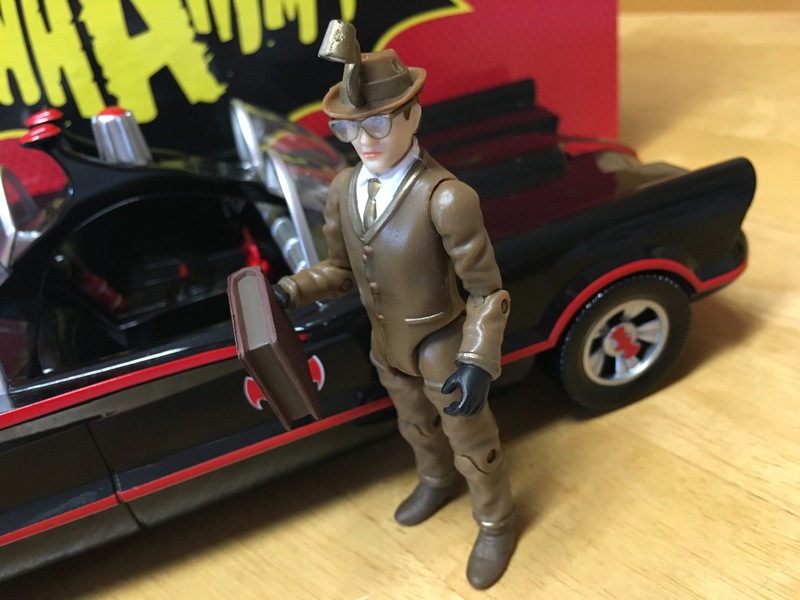 The Great: For a lot of fans, the Batman chase figure — aka Screen Test Batman — is the big get of the wave: A first-ever action figure depicting Adam West’s (and Lyle Waggoner’s) test-footage outfit. This is one of the best indications that Funko is serious about doing a deep dive with this line. The company is known for its variant and chase figures — I’ve already seen this one for sale for about $50 on eBay — and so I expect we’ll have a number of neat and unexpected figures in subsequent waves. I stopped dead in my tracks when I saw this figure at Toy Fair and the final version’s naturally much slicker. 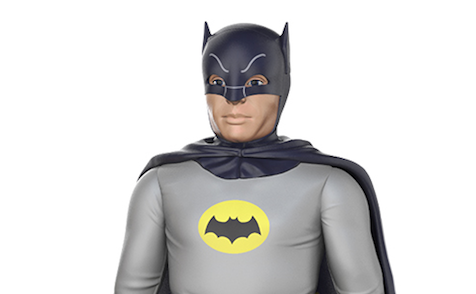 Like the main Batman single, he comes with a Bat-communicator accessory. 2. The Great: What I also love is that this isn’t just a repaint of the primary Batman figure. That would have been really easy to do but Funko took the extra step of following through and changing the heads. This one’s mask has longer, more askew ears, as we saw in that test footage. Outstanding. 3. The Quibble: The eyebrows, man. Funko has gotten so many tiny details right with these figures that it just seems so strange to me that Batman’s eyebrows would be so long and so vertical. (I noted this here, as well.) 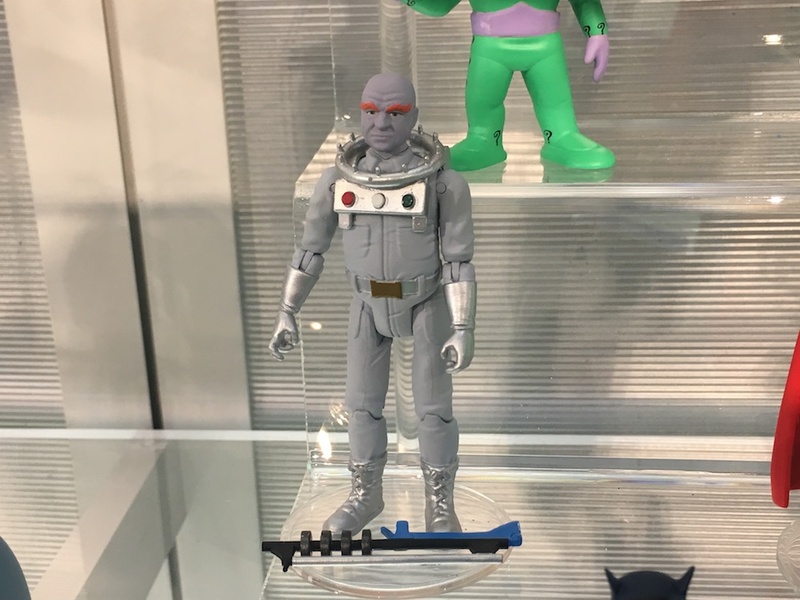 This has to be a production issue because the Toy Fair prototype and all the official concept art we’ve shown off here at 13th Dimension have it right. I really would like to see a subsequent reissue of the Batman figure in a future wave that fixes this. But that’s the only thing keeping the Batman figs from being an A+. 4. The Great: It’s hard for me to decide which figure is the tops of this initial wave of singles: this Mr. Freeze chase figure — alias Eli Wallach Mr. Freeze — or Screen Test Batman. But I think when all is said and done, it’s this one, if for no reason that it was such a complete surprise at Toy Fair. 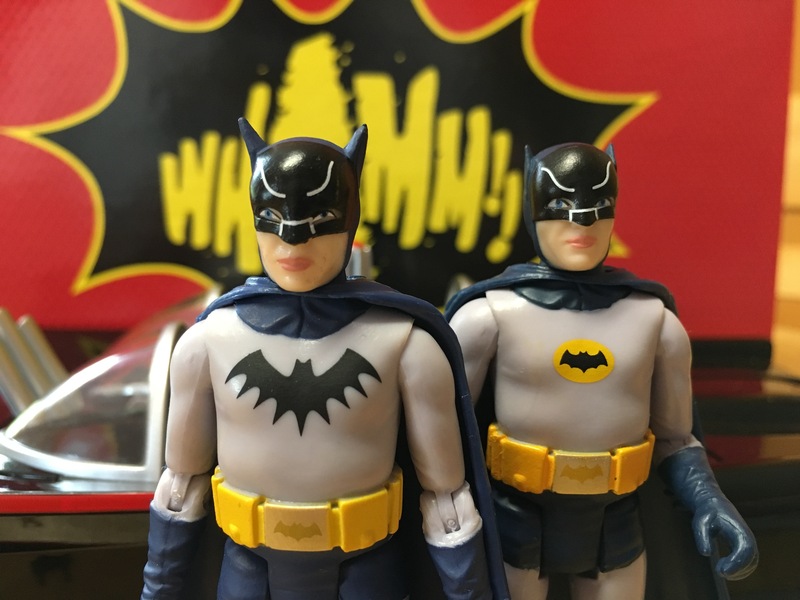 Wallach was not part of the overall Batman ’66 merchandising license, but Funko managed to get this done. 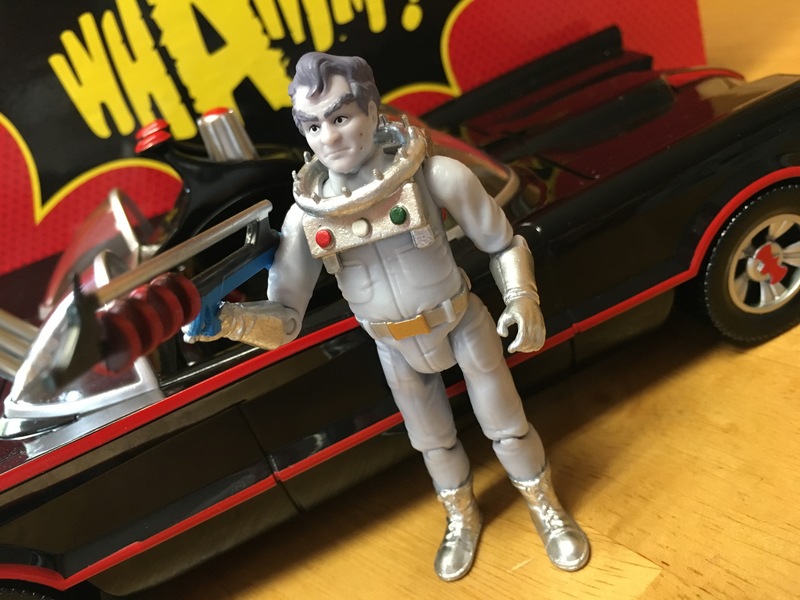 That makes this unique among all the Batman ’66 collectibles out there: There is no other Wallach Freeze memorabilia. What this augurs for other likenesses not in the overall merch deal, time will tell. 5. The Great: And it’s a terrific likeness, too, one of the best in this shrunken scale. Eli Wallach Mr. Freeze looks like the actor, with his bushy eyebrows and poofy hair. At the same time, it looks very much like a toy, occupying that happy spot in the nexus between don’t-breathe-on-it collectible and childlike plaything. And he comes with a freeze gun, too. 6. The Good: I’ve not yet picked up the main Otto Preminger version of Mr. Freeze, which is my fave-looking of all the Misters Freeze from the show. I’ll update this once I do. It’s worth noting that it’s the same exact figure as Wallach, only with a different head. Makes sense: They wore the same outfit. 8. The Quibble: It’s her likeness that puts me off a little bit. You really have to thread the needle at this scale. We’ve seen concept art of her with the mask on — on the back of the Batmobile box and here at 13th Dimension — and I think that would be an improvement. Here’s hoping that version shows up at some point. 9. 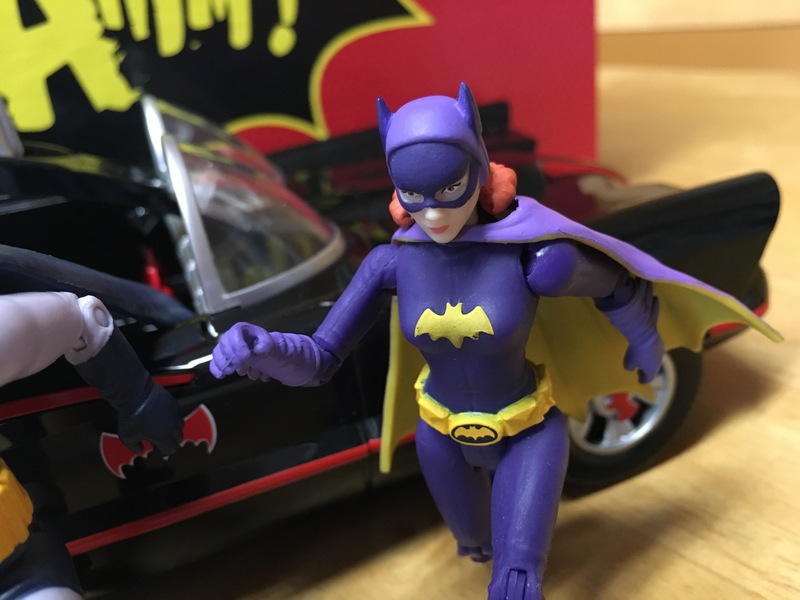 The Great: The Batgirl figure is a triumph — perhaps the best Yvonne Craig Batgirl figure we’ve seen to date. It’s interesting: Few companies have been able to really capture Craig’s distinct face — the high cheekbones, the proud, narrow jaw. Often she comes off looking like she sucked on a lemon. But not here. Action figures in masks always have an advantage, and this one really works. I was even a mite concerned when I saw her Toy Fair — she looked so sad! But in the production process, she’s come through with the standard resting face without looking glum. If you’re not going with smiling action figures, this is the next best thing. And her outfit works too, all contrasting purples and golds. Great work all the way around. 11. 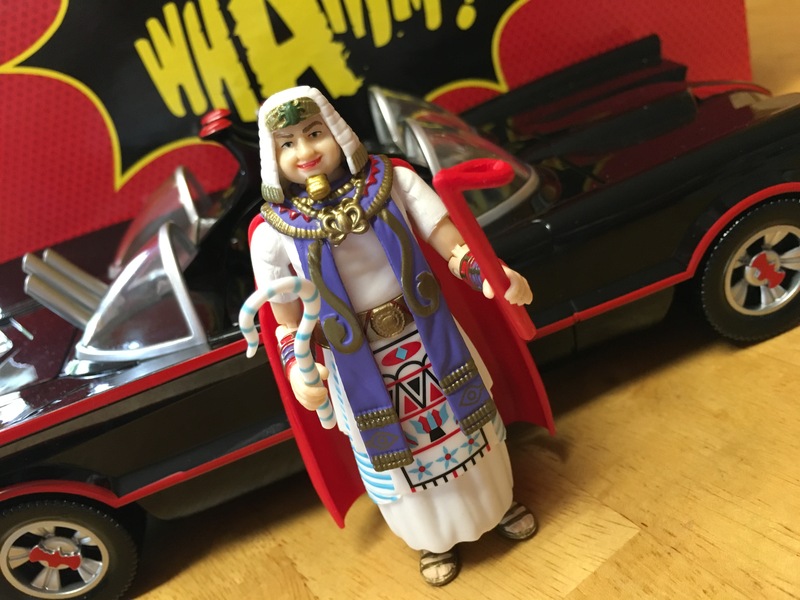 The Good: I almost feel bad for saying this since I know a lot of the Funko people really dig King Tut, but this figure isn’t quite as strong as some of the others. Which is not to say that it’s not good, because it very much is. The outfit is terrific, for sure, complete with his pharaoh’s crook and flail. And he resembles Victor Buono. He just lacks that lunatic glint in his eyes that Buono pulled off so well. That should be filed under “Quibble” though, because this is a fine figure. 12. The Great: Look, I just never dug Bookworm all that much. I think his episode is an off-note in an otherwise terrific first season. He was unhinged yes, but I never bought a sense of menace. Nevertheless, Roddy McDowall’s estate signed onto the merch deal, so Bookworm’s easily available to manufacturers. I look at him as a completist: If I’m getting all the others, I might as well get Bookworm, too. 13: The Great: The line itself is outstanding and on the whole a great start to something that I hope will be with us for the next couple of years. We’ll be doing something soon again looking ahead to Wave 2 — in the meantime, check out what Funko’s top designer, Reis O’Brien, hinted at here. The primary individual figures will run you $10-$13 each, depending on shipping, where you get them, and so on. 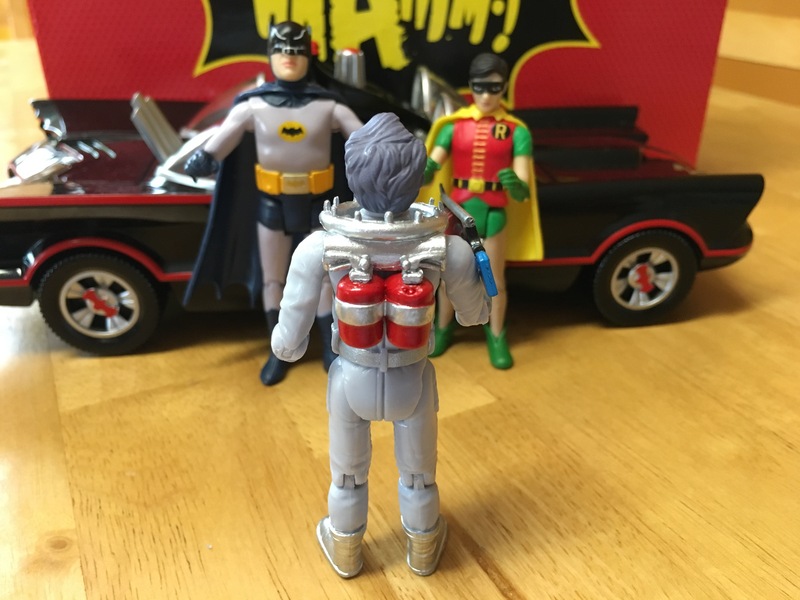 (The Batmobile set, which is the only way to get Robin, is in the $40 ballpark.) If you’re lucky to score one of the chase figs at retail, do it. The secondary market’s expensive and you don’t want to encourage scalping. Each figure has nine points of articulation, which works for this scale, giving these folks a degree of poseability you don’t always see. If they want to discourage scalping, don’t release chase figures. Just make lots and lots so I can buy two of each figure. So simple, but none of the figure makers seem to have a tiny bit of business sense. Make more figures. Sell more figures. Make more money. Simple. Exactly! I’m screaming “Take my money!” and they walk away from it. I just don’t get it. Deliberately creating variations that are impossible to obtain discourages me as a collector and makes me wonder why I should bother. I’m not a 10 year old. I am a grown man with money to spend. Treat me with some respect and you will get my business. Any concept what retailers are selling the figures to try to find a chase at retail? I’m going to be reviewing these one at a time over at Infinite Hollywood, and I started with the screen test suit. I definitely enjoy that one, but I actually think Bookworm might be my favorite of wave 1. The detail on him and his scale glasses are incredible. No one gets glasses at this scale right, and yet Funko did! I had a much different experience than you with the female figures, though. I think Newmar’s likeness is far and away the best on any of the figures, it just totally nails her. But I found Batgirl to be the worst figure of the wave, with spotty paint application, bulging hips and just a mediocre design overall. Where can we buy these? I have been to a couple Toys R Us’s and have not seen them there yet. 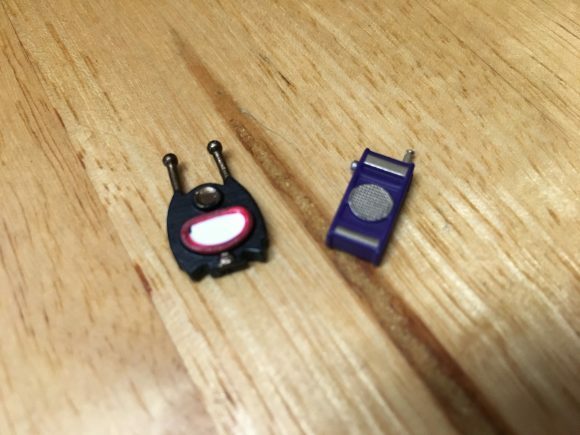 What 3.75″ figure stands would work with these? All cute, but I’m really not impressed. Feels like a collector set for kids????? I’d like to see DC do the ’66 series under their Multiverse umbrella, that I think all pretty good on the whole. But my favorite are the MovieMasters for Man of Steel. Everything they created for that movie was awesome (I mean come on! The five o’clock beard shadow on Superman???? AWESOME). Feel like Mattel took a step back with Batman v Superman. And by the way DC: How about an Amy Adams’ Lois Lane?!?!?!?!? Both Star Trek and JLU helped end fan interest in their line by having impossible chase figures. They just dont get it. I really hate Suits. I’m not sure which Star Trek line you are referring to, but JLU ended mostly because Mattel had exhausted just about every figure they could make. The online retailer I ordered from still has this wave as a pre-order. I have my Batmobile, so I am hoping that they will ship my wave 1 soon. I’ve looked everywhere for the figures. Found the Batman Mobile also, but only that.